The two work closely together, along with other members of the Crossville team, to bring to life Crossville's product introductions, design trends, and presentations, promote the company's presence at trade show, design and other events, and communicate the success stories behind design community tile installations. They do so by integrating social into the mix. I caught up with the two to learn more. CB: Lindsey, tell me about your background and role with Crossville. LW: I started my career as a graphic designer in the furnishings industry, eventually working my way into set design and tradeshow / event design. My career in the flooring industry kicked off with a roll in product development and management for a wood flooring company, and then brand management and creative services for Mohawk Industries. All of this has come together in my role with Crossville, where I lead the marketing team in event marketing, product presentation, and marketing communications to our distributor and designer customers. CB: Irene, your turn. What's your background and role with Crossville. IW: I’ve been agency-side most of my career and have spent the last couple of decades leading PR, marketing, and social media for clients in the tile, interiors, and building product industries. 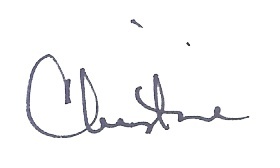 Today, I have my own firm, Msg2Mkt, LLC, and Crossville is our anchor client. 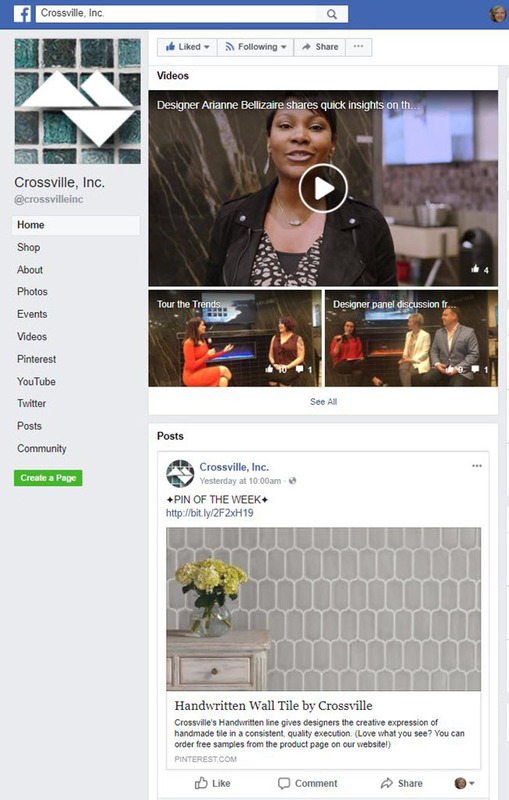 CB: How does social media fit into Crossville’s marketing? LW: For me, I see it as another avenue to connect with our customers, albeit in the digital space. Commercial designers are more limited in their time than ever, and yet their product choices appear to be limitless. As a brand, we need to carry on a conversation with them even when our reps can't be there face-to-face. Social media is more than just social. Our blog gives education and information. Instagram and Pinterest provide inspiration. And Facebook connects us all. IW: We take a truly integrated approach to marketing so that everything works together to build the brand and amplify our messages. Social is a measurably effective way to be in touch and nurture relationships daily with key audiences, as well as get ongoing market insights and clue in on industry topics and conversations. We use it intelligently and strategically support overall marketing goals. CB: Which networks are you active on and which ones are you having the most success with for Crossville? 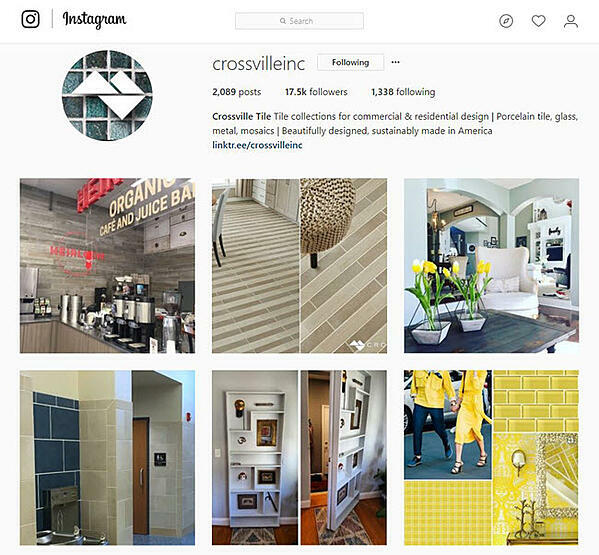 IW: You can find @crossvilleinc active on all the platforms that are most popular with the A&D community today—Instagram, Facebook, LinkedIn, Pinterest, Twitter. All of the above fit specific roles within the mix. Instagram is a great platform for the design world because it’s so visual. Our distributors, dealers, and many A&D firm leaders keep up with LinkedIn, as well as Facebook. Pinterest is excellent for sharing products. CB: How do you integrate social activities with more traditional marketing (including in real life activities)? IW: Our social presence is an excellent amplifier of our participation in live events such as trade shows and show houses. We use Facebook Live to broadcast panel discussions from our trade show booths. We capture and share happenings at special gatherings and events. It’s a way to bring the excitement to those who aren’t able to attend in person, and the content then lives on our profiles and our blog so that the in-the-moment opportunities have much longer shelf lives and lasting value. 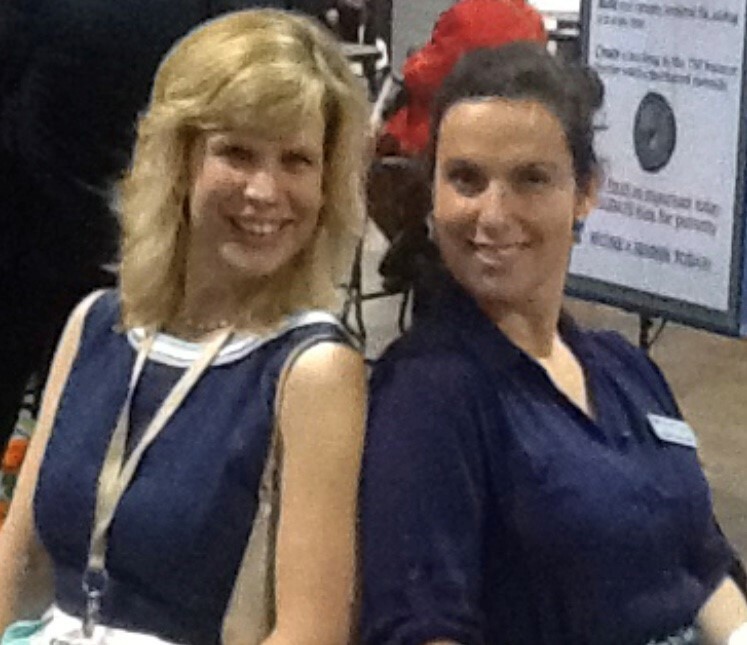 LW: I love to incorporate social media with our trade shows and events. From announcing where we will be, to real time access with Facebook Live sessions and Instagram Stories, to providing a post event recap, social media is the best tool to get the word out. It keeps people connected when they can't be with us at an event, just like it does when a rep isn't right by their side. I think the video sessions have been fun, as well as informative, and we get so much traction on them after the event. CB: What have been your biggest surprises? Disappointments? LW: There is a lack of hashtags catching on with the designer audience. I think commercial designers are more watching and viewing than involving themselves the way residential designers do. For residential, this medium has the ability to make you an influencer and get brands to buy in pretty quickly. That makes me happy to see a level of involvement throughout the interiors industry with residential designers. 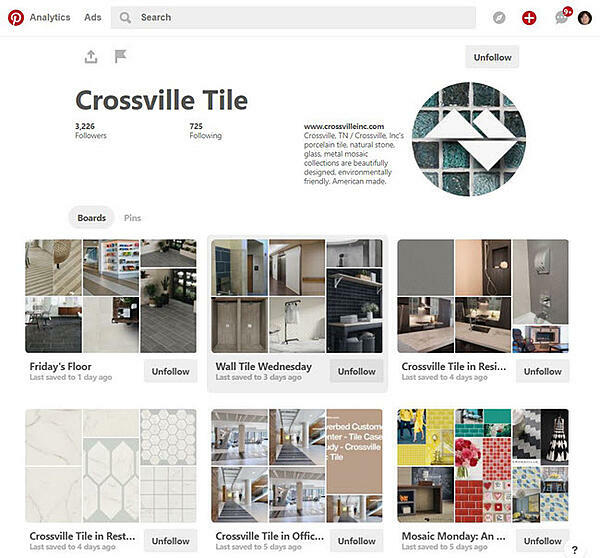 The other surprise is how Pinterest has become a source of inspiration to commercial designers. It isn't just for crock-pot recipes anymore. Even folks at big firms are using it to get their creative juices flowing. IW: It’s really interesting to see how social media evolves over time. For example, 5 years ago, Twitter was actually our most active platform—so much great engagement each day. Then Instagram came along and captured everyone’s attention, so the energy shifted. We have to be in front of the changes and always ready to pivot. CB: What have you learned from doing regular Facebook Live events at shows? LW: That my mother watches! Seriously though. Every person you know needs flooring sooner or later, and even your friends and family are engaged. Another thing is how nervous people can get when the camera turns on. In this day and age when everything is posted and presented and tweeted and regramed, one would think we would all be desensitized, but when you go live all bets are off. As a moderator, making sure that your guests are at ease is critical. And have fun with it! These sessions should be informative but also light... like a perfect midday info snack. 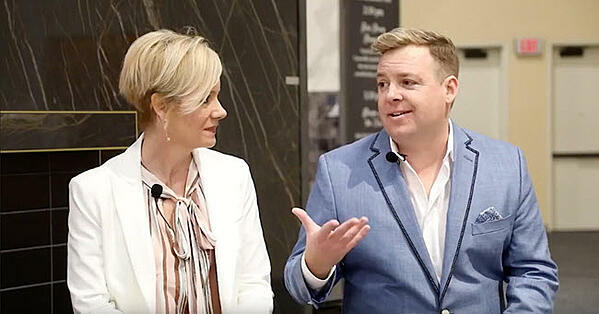 Here is the 21-minute Mix with the Masters video designer panel discussion from SURFACES 2018 with talented interior designers Kerrie Kelly (Kerrie Kelly Design Lab) and Christopher Kennedy. I facilitated the conversation about mixing interior design styles across decades of design. This was also a Facebook Live event. IW: We love the lasting benefits of Facebook Live events. We repurpose the content long after the shows are over to maximize the effort; it can be a gift that keeps on giving in terms of shareable, informative content for our audiences. We repurposed the interview above into a blog article titled "Crossville Designer Panel Discussion: Mix With The Masters." CB: You participated in the second annual Southern Style Now Festival and Showhouse. How was Crossville incorporated and what role did social play in the event? 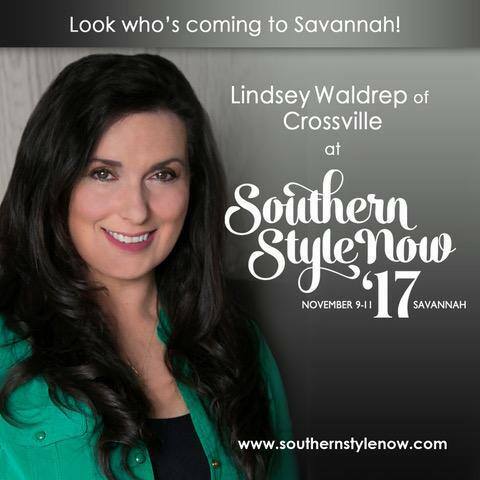 LW: Crossville was the sponsor of both the showhouse and festival for Southern Style Now 1&2, and we have signed on for #3. As a sponsor of the Traditional Home showhouse, we provide tile for the spaces. Social comes into play with our account, Traditional Home's Instagram, plus all the designers and attendees who walk through. It's a huge amplifier for the brand and the local distributor. For the festival, they broadcast our logos and we also have moderated a few panels, which we have presented on FB Live. We have also helped host cocktail events and CEU classes during the festival. It is an amazing multi-day event that provides us with huge brand traction in the southern design community. IW: The attendees, designers, and brands involved in this and all the showhouse events we are part of are very active and savvy on social. Social is a great way to deepen in-person meet-and-greets. 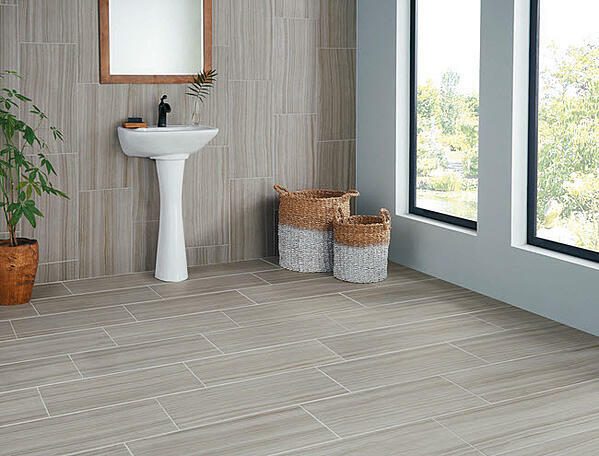 We serve as sponsor and supplier of tile for rooms within the showhouses, and that means we come away lots of impressions on social media during the course of the events, as people post and mention us and our products online. Plus we also collect beautiful imagery that can be used to tell our brand and product stories in many ways in the short and long terms. CB: How do you divide and conquer on social since it can take a lot of time? LW: Irene takes care of everything.... Robin and I are just on-screen talent - LOL. But honestly, Robin Rhea, our brand director, does an amazing job redistributing assets through digital marketing communications outside of social. IW: It’s vital to prioritize social and have a dedicated team on the case. However, even a dedicated team can’t be everywhere, all the time. We ask all Crossville regional managers to act as reporters to capture pics and details when they host events across the country. We have execs take photos at the events they attend. We plan ahead based on what’s on the calendar, reach out to event partners to coordinate messaging, etc., and we ensure there’s a social component for just about everything we do. It’s a fundamental aspect of how we communicate and share. CB: What are the biggest trends in tile and design? LW: Bigger and bigger / smaller and smaller. Large format and panels are hot but then so are pennyrounds. 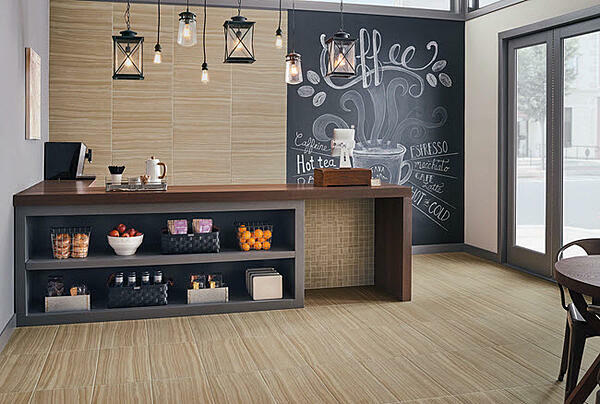 I think design is a study of contrasts and it couldn't be any more true right now with tile. I love that vintage styling is taking hold with texture and color, and that digital has given us the opportunity to bring hyper realistic looks to stone and wood. >> See J&R Tile's Erin Albrecht Talks Tile in a Tiny House and Tiled Vitruvian Tiny House by BlueTreeHome's Nikki Vega Mimics Nature to see how Crossville Tile products transformed a tiny house during Coverings 2017. IW: It’s a fun time in the tile industry. The markets—commercial and residential—are loving the new looks and styles that we’re creating. We already one product launch into what is going to be a busy year of introductions for Crossville. Follow us on social to see what’s next! CB: What’s next on the horizon for Crossville? LW: Well you are going to have to follow us to find that out! Honestly we are moving into a lot of "behind the scenes" programming. These are initiatives that will allow us to better communicate as a brand and give the designer what he or she needs to develop their own creative solution with Crossville. CB: How can readers learn more about Crossville? These are the two best places to get ideas and education from us. And make sure to check the case studies portal of our web site twice a month for our latest and greatest projects. CB: Lindsey and Irene, thanks very much! What's your reaction to this conversation about using social media marketing to promote tile products? Have you tried some of the approaches Lindsey and Irene discuss? What has worked best for your business?